An act signed last week by US President Donald Trump has rare earths companies hoping they will be able to fill demand from the country’s defense department. After the signing of the John S. McCain National Defense Authorization Act last week, a number of rare earth element (REE) producers outside of China have come forward ready to meet American quotas, as well as demand outside the country. The omnibus document, which covers military spending and procurement, features a short section forbidding the US military from purchasing Chinese permanent magnets using REEs. Similar magnets produced in Iran, Russia and North Korea are also included. Those few paragraphs in the 788-page document have sent a resurgence through the REE sector. Although the American military is a relatively small market for REEs, optimism has abounded in the space. However, it takes more than optimism to bring a mine into production. So which companies are actually positioned to benefit from this announcement? “There is one company that is already separating rare earths in the US, and that is a private company, Rare Earth Salts,” said Jon Hykway, sector analyst, president and director at Stormcrow Capital. “They are already doing the hard part, with non-Chinese feed. So that’s interesting, and given the small size of US Department of Defense (DoD) buying, they might be the one and only supplier that the US DoD requires,” he suggested. For Canada-headquartered Medallion Resources (TSXV:MDL), the Trump administration’s announcement is a leveling of the international playing field of sorts. With an ongoing magnet metal project in Nebraska, Medallion is confident its production plan can provide significant quantities of rare earths over the coming years. “The Trump administration has sent a clear signal that it knows it is strategically exposed to rare earth supplies — this is not news,” said Don Lay, Medallion’s president and CEO. “What is news is that it is putting in specific language that it demands rare earth magnets be sourced from non-Chinese sources. So the ‘rest of the world’ now has extra incentive to start to rebuild this value chain so that there are at least alternatives,” he explained. Lay sees the US’ new stance on permanent magnets as a changing tide for Japanese and German magnet makers, as well as companies outside of China that can provide material inputs for these magnets. The REE sector is quickly expanding, and is forecast grow even more as more companies and citizens of the world embrace the move towards electric vehicles (EVs), an end user of REE permanent magnets. Any supplier of REEs to the US military will have to have its entire production and feedstock supplies outside of and independent of China — no small task for an ever-growing global supply chain. 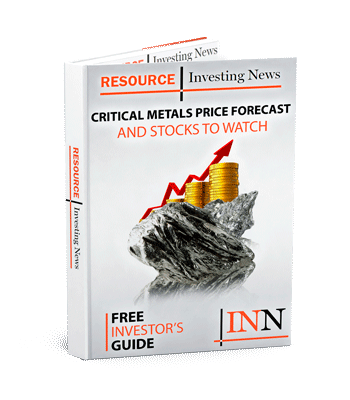 Emerging REE development-phase and technology company Ucore Rare Metals (TSXV:UCU) may be one of the more favorably positioned suppliers, since its operations are in Alaska. Currently, Ucore is at the advanced engineering stage of developing its Strategic Material Complex (SMC) in Ketchikan, Alaska, a site featuring an industrial base, deep-water port and proximity to the Bokan heavy REE project. “The Alaska-based SMC will be utilized immediately for the processing of REE feedstock originating from domestic and non-Chinese international locations. These sources are already producing mixed chemical concentrates that Ucore expects will suit our technology platform,” said Jim McKenzie, Ucore’s CEO. The company sees the announcement and the burgeoning EV revolution as the perfect opportunity to assert itself on the global rare materials stage. “The imminent tipping point for a global transition from internal combustion vehicles to e-mobility will dramatically alter the demand for rare earth magnets and lithium batteries,” added McKenzie. America will source its REE supplies from outside China but not only from within its own borders; look at Lynas now with the majority of Japanese NdPr supply. This will be a race by prospective companies to get financing to get up and running and to get product to market. There are a lot of companies in this race (e.g., Lynas is clearly there with Peak, Alkane, Arafura, Greenland, Northern, etc behind). Companies like Rainbow and Medallion will just supply raw material to refiners to produce product. However, there is only so much REE that the world needs although that is increasing with the ongoing green revolution. however, only literally a handful of these upstarts will make it and the rest will not get the financing they need as they will have missed all the major offtakes agreements that are dangling out there which means no financing.